An example of the search for order in settlement or other patterns in the landscape is the use of a technique known as nearest neighbour analysis. This attempts to measure the distributions according to whether they are clustered, random or regular. 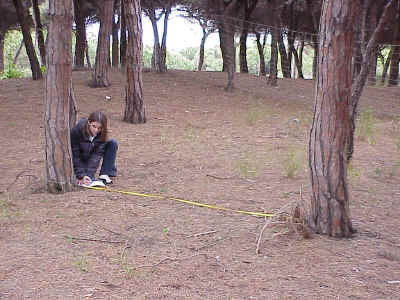 Nearest neighbour analysis may be used in sand dune vegetation succession studies to test the hypothesis that 'the stone pine woodland forms the climax community'. Here, tree distribution may be expected to be random, rather than the regular pattern expected if the trees had been deliberately planted as part of a sand stabilisation scheme. 1. Select an area of woodland using random numbers, and mark out a 30m X30m (900m�) quadrat. This should be sufficient to obtain a minimum number of 30 trees (see minimum sample size below). 3. Apply the above formula. This 1.27 Rn value (which becomes 1.32 when reworked with an alternative nearest neighbour formula provided by David Waugh) shows there is a tendency towards a regular pattern of tree spacing. However, with fewer than 30 trees, it is difficult to to say with any confidence that the distribution has this regular distribution tendency, and the pattern may have occurred by chance. The Rn value lies within the yellow shaded area on the diagram below and therefore has a random distribution at the 95% probability level. The Rn value must lie outside the shaded area before a particular distribution pattern can be accepted as significant. 1. There has been no new natural pine germination since the planting (if any) of the woodland.